Huayna Capac was born in Tumibamba (Cuenca, Ecuador), and raised in Cuzco. He became the eleventh emperor of the Incas in 1493, following the death of his father Tupac Inca. Huayna was one of the youngest of Tupac's 62 sons. His name means “young king” in the Incan language of runasimi. His mother was called Mama Ocullo, and she was very strong-willed queen. Huayna listened to her advice and obeyed all of his mothers decisions. Huayna's blood line was considered pure because he was the son of a sister queen. At the time of his coronation, he was simultaneously married to his sister, Coya Cusy Rimay. It is believed that she was the mother of Ninan Cuyoche. When she died, Huayna married their younger sister Coya Rahua Ocullo. She was said to be very beautiful, with a deep love for music. The oldest of their sons was named Topa Cusi Huallap, and he became known as Huascar. Huayna also kept an enormous concubine filled with thousands of the most beautiful women in the kingdom. 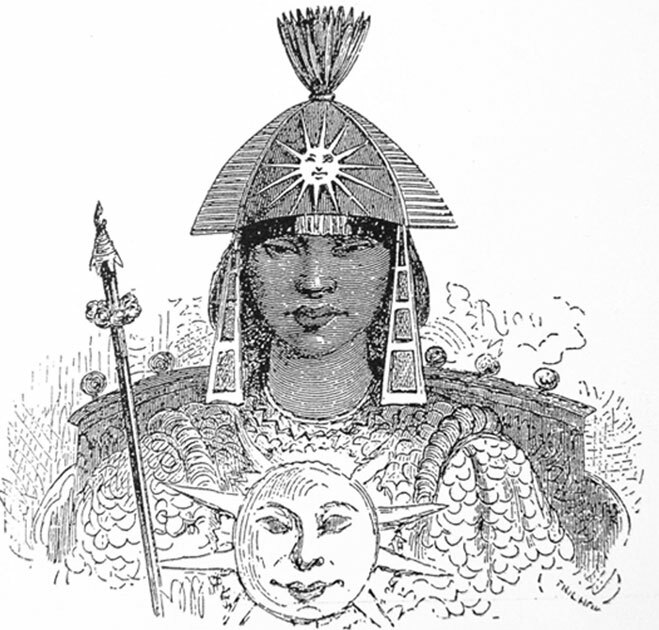 Atahualpa's mother was the emperors cousin, and he was considered Huayna's favorite son. In all, Huayna Capac would have hundreds of sons and daughters. Soon after the death of Mama Ocullo, Huayna Capac would begin inspecting the far realms of his kingdom. However, he soon found that almost everything worth conquering had already been conquered by his father Tupac Inca and grandfather Pachacuti. In Bolivia, he would be turned back by naked Chiriguano Indians, and then in Chile he would again be repelled by the Araucanian Indians. In Argentina he would be stopped by vast, uninviting salt flats. Next, Huayna found that the eastern limits of his kingdom melted into vast wilderness. Huayna Capac soon put his sights on conquering the rich goldsmithing cultures of Columbia and Ecuador. For this huge task, he formed an army of two hundred thousand men. In many ways it also became a religious crusade, as Huayna spread the gospel of the Creator of the Sun. Joining Huayna on this crusade were at least a thousand women from his concubine, and his two favorite sons Atahualpa and Ninan Cuyoche. Huayna traveled in a royal litter that was carried on the shoulders of men who had been highly trained just for this task. After a long journey, they arrived in Huayna's hometown of Tomebamba. Here Huayna built a palace with walls inlaid in mother of pearl, and then began drinking excessively. After many months in his hometown he again continued his quest to conquer the goldsmithing cultures. Soon he met fierce resistance in Columbia where the Pasto Indians stopped them. Next, Huayna would suffer both wins and defeats in Ecuador. Huayna Capac, his sister-wife, his brother, uncle, and heir apparent Ninan Cuyoche would all die of Small Pox in 1527. His death would set of a dynastic struggle between Atahualpa and Huascar called the War Between the Brothers. In all, over 150,000 would die.